India became the fourth largest auto market in 2017. The automobile industry in India is world’s fourth largest, with the country currently being the world's 4th largest manufacturer of cars and 7th largest manufacturer of commercial vehicles in 2017. Indian automotive industry (including component manufacturing) is expected to reach Rs 16.16-18.18 trillion (US$ 251.4-282.8 billion) by 2026. Two-wheelers dominate the industry and made up 81 per cent share in the domestic automobile sales in FY18. Overall, Domestic automobiles sales increased at 7.01 per cent CAGR between FY13-18 with 24.97 million vehicles being sold in FY18. Indian automobile industry has received Foreign Direct Investment (FDI) worth US$ 20.85 billion between April 2000 and December 2018. Domestic automobile production increased at 7.08 per cent CAGR between FY13-18 with 29.07 million vehicles manufactured in the country in FY18. During April 2018-January 2019, automobile production increased 9.84 per cent year-on-year to reach 26.26 million units. During April 2018-January 2019, highest year-on-year growth in domestic sales among all the categories was recorded in commercial vehicles at 22.79 per cent followed by 14.79 per cent year-on-year growth in the sales of three-wheelers. The passenger vehicle sales in India crossed the 3.2 million units in FY18, and is further expected increase to 10 million units by FY20. The government aims to develop India as a global manufacturing as well as a research and development (R&D) hub. It has set up National Automotive Testing and R&D Infrastructure Project (NATRiP) centres as well as a National Automotive Board to act as facilitator between the government and the industry. Under (NATRIP), five testing and research centres have been established in the country since 2015. 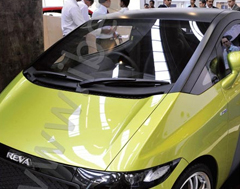 The Indian government has also set up an ambitious target of having only electric vehicles being sold in the country. Indian auto industry is expected to see 8-12 per cent increase in its hiring during FY19. The Ministry of Heavy Industries, Government of India has shortlisted 11 cities in the country for introduction of electric vehicles (EVs) in their public transport systems under the FAME (Faster Adoption and Manufacturing of (Hybrid) and Electric Vehicles in India) scheme. The first phase of the scheme has been extended to March 2019 while In February 2019, the Government of India approved the FAME-II scheme with a fund requirement of Rs 10,000 crore (US$ 1.39 billion) for FY20-22. Number of vehicles supported under FAME scheme has increased to 192,451 units in March 2018 from 5,197 units in June 2015. Automobile exports grew 15.54 per cent during April 2018-February 2019. It is expected to grow at a CAGR of 3.05 per cent during 2016-2026. Domestic two wheeler industry is expected to grow at 8-10 per cent during FY19. Also, Luxury car market in India is expected to grow at a 25 per cent CAGR till 2020. The Government of India expects automobile sector to attract US$ 8-10 billion in local and foreign investments by 2023.
india is expected to become the third largest market for electric vehicles by 2025 at 2.5 million vehicles.